Parkland Place is a rehabilitation centre to help people that suffer from addiction, be it to drugs, alcohol, gambling or other harmful behaviours. 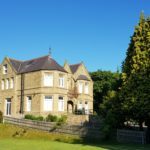 They offer therapy to their patients in a beautiful 16-bedroom mansion with lush green gardens set in an undoubtedly idyllic location of North Wales. The house is surrounded by farmland and it has a cosy and welcoming environment that helps those on the path to recovery. The rehab programme is customized to suit each guest’s individual needs. It is owned by the National Trust and managed by friendly and experienced staff that can help guests feel right at home. The psychological and social needs of each individual are addressed, and they have fantastic and unrivalled support that can help them to bring a positive change in lifestyle. The guests at this place have to remain abstinent during their stay and often provided a structured dose of medical detoxifier before they can begin letting go of the addiction. The detox clinic located in the Salus Withnell Hall is accessible to all to provide a unified therapy experience. The mansion is influenced by the arts and its large rooms with high ceilings house many unique architectural features that give it character. Parkland Place has gardens sprawled across three acres of land which is surrounded by woods and wildlife. Each guest is given a private suite with its individual style. They have many options to choose from and the windows offer views of the green grounds and other areas. North Wales is known for its rich history and culture and with the mansion set against a splendorous backdrop it is easy to make recovery. The sole aim of the people at Parkland Place is to change the lives of their guests. The therapeutic programme is built in a way that you are confident in becoming the best possible version of yourself. You can regain your confidence using all the support available. Before joining the rehab everyone has to go through a full assessment to help determine their needs and build a program specific to them. The addiction as well as social issues you might be facing are all addressed during your stay at Parkland. The team addresses every aspect of their guest’s lives and provide them with an entire toolbox of techniques they can use to get ahead on the road to recovery. All the interventions held here are based on 40 years of experience treating patients of substance abuse and mental health problems. The skilled staff delivers therapy and there are many of them who have conquered their own addictions in the past. Every part of the rehab programme is designed based on evidence and we focus on the person to derive a practical solution. Therapies include cognitive, metacognitive and behavioural techniques which make up the successful recovery programmes.